Budget has cars to meet all your needs. Whether on a short business trip, on holiday with the family or simply a replacement vehicle needs, you can hire a budget car at the right price. All cars in the Budget fleet are reliable and well maintained. Choose a small car for urban transport, or opt for a more luxurious car. With over fifty years experience in car rental, you can rely on Budget for the best service at the best price. With a good reputation worldwide, Budget is a global name in car rental discount. 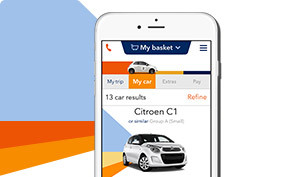 Rent your Budget car in 128 countries, with everywhere the same reliability. Our staff is committed to delivering a wide range of rental cars that meet your needs, both in airports and at rental locations in the city, all over the world. Budget makes it easy for all your rental needs to arrange online. Our goal is to provide a quality car for everyone, at an affordable price.